Sometimes a game comes along that's premise is so awesome, so original, we simply can't ignore it - regardless of whether or not that game has cooperative gameplay. 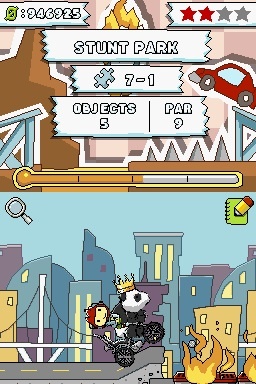 Scribblenauts for the Nintendo DS is that game. The idea behind it is fairly simple, collect a star - win the level. The trick behind the 200 plus levels in the game is how to obtain the star. The game is completely open in the puzzle solving, all that is required is for the player to write the word of an object to help obtain the star. For instance, if the star is stuck in a tree; you could write Ladder. The game would spawn a ladder, you'd climb it, and collect the star. Or you could write chainsaw, and cut the tree down and collect the star. Perhaps you would write lasso, and pull it down. The game is powered by the Objectnaut database of over 10,000 words that you can write to spawn objects that you can fully interact with. Sound cool? Well it is. And to prove just how open ended the game is here's an example from a NeoGaf forum post (via BritishGamingBlog) in which a member was playing the game at E3. Forum member Feep told his story of playing the game, and his frustration when he came up against a horde of robot zombies. After generating simple items such as a raygun, pickaxe, torches, in frustration, he tried “time machine” – and one actually appeared. Upon entering, there was the choice to go in to the past or the future, and going back in time he found himself surrounded by dinosaurs. This was post #217 on Neogaf, and it became so famous that the developers put "Post #217" into the game as an object. Yep, the system is that powerful. The game simply came out of nowhere at E3 2009, and in fact, won a ton of awards. So what else does this game do? Well for one you can create your own levels and share them online. It just blows my mind this title is being created on a handheld system, and fit into a cartridge. And while the game doesn't have traditional co-op play, I can easily see this as a game a group of people get together and pass around, laughing, and just generally having a good time. 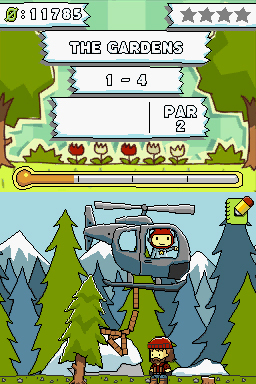 Look for Scribblenauts on the Nintendo DS in September.